Recoleta is a contemporary typeface created by Jorge Cisterna and published by Latinotype which is available in 15 styles, 2 widths (Regular & Alternates) each with 7 weights (from Thin to Black) and a wide range of OpenType features . It is characterized by soft shapes and angled strokes. It merge well on book, display, editorial use, magazine, logo, packaging, poster and so on. 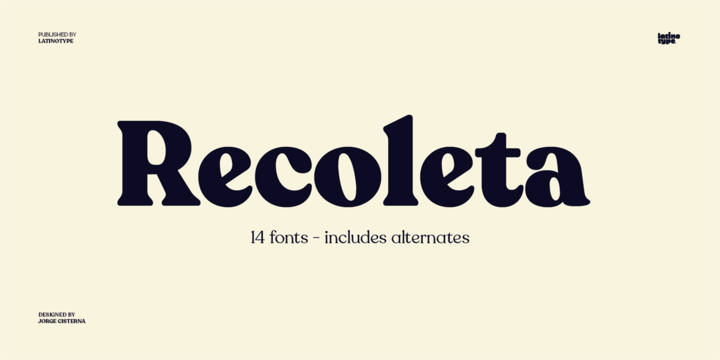 Enjoy Recoleta font! Price: starting from $29 for one font to $129 for all 15 fonts. A font description published on Tuesday, June 12th, 2018 in Fonts, Jorge Cisterna, Latinotype by Alexandra that has 5,856 views.